I cannot think of any reason that one would choose Ushuaia [Oosh-wy-ah] as a destination other than to board one of the many vessels that go to the Antarctic Peninsula. This was our reason for alighting there, at the southernmost tip of South America, in February. Having a couple of days to spare on either side of our sea voyage, we had the opportunity to discover for ourselves this very busy port and its surrounding area: Tierra del Fuego, land of fire. The long flight from Buenos Aires afforded us excellent views of Patagonia, vast, arid, inhospitable looking. We made a brief stop at El Calafate airport, a simple landing strip near a deep turquoise lake, and then flew the last, short leg of our journey into Ushuaia. The impressive snow-capped mountains gave way to a view of the Beagle Channel (named after Darwin’s ship) and our first glimpse of Ushuaia itself. We were pleasantly surprised by the warmth (11 degrees) and bright sunshine which greeted us and took a taxi through what resembled a frontier town, along a few miles of pot-holed roads to our hotel, the Los Nires. This was a lovely new hotel and quite incongruous with its shabbier surroundings; the majestic mountain backdrop took our breath away and the room was clean and new with a wonderful view over the bay. However, in the space of about an hour, we had heavy squalls, bright sunshine, hail and fierce winds – just what we expected from all the books covering this part of the world! On entering the large, attractive dining room, it was clear that its management had enthusiastically embraced the concept of air-conditioning. Not one for tolerating freezing temperatures (okay, I was off to Antarctica and I was prepared for that – but why do people deliberately engineer bracing indoor temperatures? ), I went back to the room to get an extra layer of clothing. Temperature notwithstanding, the restaurant was very good indeed. We ate well, if somewhat stunned by the high prices, which appeared to be in dollars. We had read that dollars and pesos are both accepted and used here but did not discover until the following day that the symbol for both is $ and that they almost always mean pesos (there are 3 pesos to the dollar). This released our budgeting from the emergency constraints we were considering applying. It also made us regret telling the taxi driver to keep the change from the ten US dollar note we had given him. Lucky man – but the taxi drivers probably reap this particular reward on a regular basis. After a thirty-hour journey from London, we had a much needed horizontal sleep, a very good buffet breakfast and then took the hotel’s minibus into town. Unsurfaced roads were lined with colourful corrugated pitched roofs, which no doubt provide the best protection against wind and rain. As the minibus bounced its way along, we could better appreciate this rapidly expanding town. Some dwellings were little more than two pieces of iron placed and held together, their fronts like rogue isosceles triangles, while others were more permanent, with wooden or concrete walls. At the port area, the main roads became much better, shops came into view and we decided to visit one of the museums. The Yamana Museum cost $8 each to enter – it was at this point that we began to suspect the currency issue mentioned above – and was very interesting. It is a small museum, devoted mainly to the Yamana, the native peoples of this area. I was quietly pleased that I had read so much about them before the trip, as much of the information was already known to me. With our increasing currency confidence, we then decided to visit the much larger Maritime Museum and paid our $20 to go inside. The prison museum is on two levels and requires a couple of hours to take it all in. Displays are inside the various cells and cover Antarctic exploration, the history of the prison itself and local history. Owing to my pre-trip reading, “quietly pleased” was approaching “seriously smug” by this time. After several hours of concentration and leg work, we strolled along the bustling main street in search of a café and happened upon a corner café, aptly named La Esquina, a place we were to get to know well during our few days in Ushuaia – hot tea and terrific cakes! Fully ‘caked’ and rested, the decision was made to use the services of one of the dozens of Internet café to let those at home know we had arrived safely. This we did, at the ridiculously cheap price of 2 pesos (30p) for 10 minutes. We continued our walk up and down this hilly ‘almost-mini-metropolis’, remarking on the recurring theme of animals strapped over open fires in the windows of eating establishments. I like barbecues very much but the sight of whole carcasses smoking over coals did rather put me off. Not enough, however, to make me vegetarian. 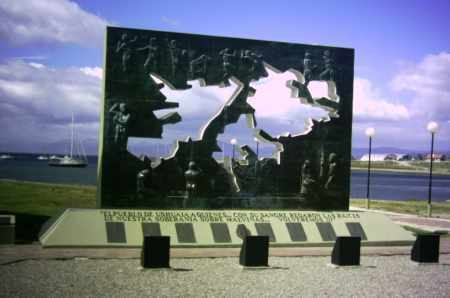 Continuing our promenade, we walked the length of the port, photographing sights of interest, including Argentinian naval ships, the Antarctic expedition ships, the utterly amazing mountains and a rather stunning jigsaw-style sculpture commemorating the Argentinian War dead. There were white horses on the waves as the wind was quite strong at times and there are the inevitable wrecks all along the coastline. One such wreck was very inappropriately called the St Christopher (sic) and this was also the name of the restaurant where we had dinner later that evening. Food is excellent in Ushuaia and very reasonably priced: once you know your pesos from your dollars! The next morning we were up early, as our bags had to be packed and taken to the ship long before we could embark in the afternoon. That done, we had a few hours to kill and this was expertly accomplished by our tour guide, Claudio, from Rumbo Sur, the local tour operator. 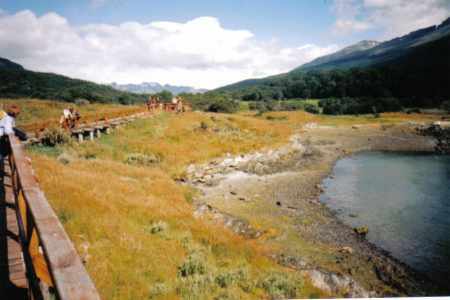 The coach took us to Tierra del Fuego National Park and involved a longish drive with only three 20 minute stops for a quick look at lakes, abandoned beaver lodges and dams. This is not our preferred method of seeing the world, but on this occasion we had no choice. We learned a lot from Claudio, who told us that the population of Ushuaia is now 55,000 and the average age is twenty; in every way it is a booming town, just about keeping pace with the huge surge of interest in and demand for Antarctic travel. We had noticed a large number of apparently wild dogs roaming the streets. These, according to Claudio, did actually have owners but they were neither tagged nor kept in and so they wandered all the time. At one time there were many red foxes in the park but they had been hunted to extinction by such ‘wild’ dogs. Also of interest was the fact that beavers had been introduced in 1946 for their pelts. These never grew thick enough to be of value and so they were released into the National Park, thrived for a time, but then went over the mountain to Chile. An uneasy relationship still exists between these neighbours, the border running along a ridge which is visible from the National Park. We admired the abundance of lichen on the trees, which, our guide assured us only grows where the air is 100% clean and found ourselves breathing deeply before returning to the steamed up coach. At our next stop we enjoyed more hunks of meat at the lunchtime barbecue (presentation is not a high priority here!) with a lovely salad and dessert. Then it was time for our Antarctic adventure on the Professor Multanovsky with Quark. This cannot be adequately described within a piece about Ushuaia. Suffice it to say that it really was the trip of a lifetime and well worth the cost, effort, planning and recovery time. 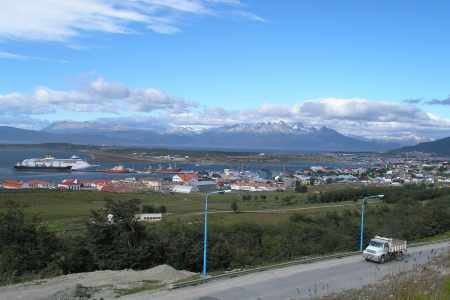 Ten days later with sea-legs replaced by the land variety, Ushuaia greeted us like a familiar friend. There were still two days before our Argentinian Airlines flight would take us on the long journey home and we were planning a bit of pampering: a brand new cabana on a wooded mountainside just east of the port, but at just about walkable distance from town. Two nights here, in a split level, open plan cabana with all mod-cons, a jacuzzi and an English speaking proprietor were in stark contrast to the little cabin we had become accustomed to on a small vessel with Russian crew! But we were not complacent. Having travelled this far, we wanted to make the most of our stay and so we took a taxi (£1.50) to the aerosila, went up in the precarious chair lift and ascended very serenely to the foot of the Martial Glacier. The climbing route followed a river for part of the way. It was steep and not a little hazardous, punctuated by blue markers to keep visitors on track. The view across the Beagle was marvellous but I couldn’t help wondering how many rescues are effected up in these mountains every year. The weather can turn so quickly here. We passed one or two parents carrying small children – even babies – over this dangerous terrain. Once down from the glacier, we had a hot drink and snack at the well-named ‘Refugio’. I was reluctant to leave this wonderfully cosy place. After a windy but quiet descent, we had a final walk through town in search of souvenirs but, very surprisingly, there was minimal Antarctic paraphernalia, so we simply ended up with a T-shirt each. We returned to the secluded Patagonia Villa and a relaxing real fire. I can’t say I would ever have made a point of going to Ushuaia, had it not been for the sea voyage, but it is a strangely alluring place and I have absolutely no idea why. It has drastically changeable weather, a scary range of housing and dogs roaming the streets. But it is alive, full of contrasts, and the people are tolerant of visitors (although not over-friendly), and they have no qualms about playing “Don’t Cry for Me Argentina” almost everywhere you go! 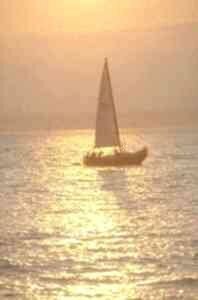 If it was nearer, or if I were wealthier, I would go again.